Slide It, Don't Fight It! Life is Too Short! Our on-time technician will be able to make most repairs on the spot. We repair all types of sliding doors, and as that is the basis for our business you can be assured that we will get it right the first time. We can save you many hundreds of dollars by allowing us in your home to repair your sliding doors instead of replacing them. All repairs are guaranteed. We repair all types of sliding doors. 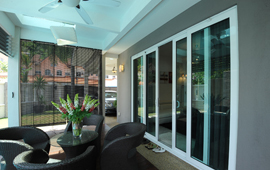 Repairing glass patio doors, wardrobe doors pocket doors and tub enclosures are our specialty. We stock hard to find parts so that we can do the repairs at the time of service. We have replacement parts that are not available to others. We also service pocket doors, sliding door locks, miscellaneous sliding door hardware and reseal leaks. Give us a call today from our locations below. Chances are we can be there in a day or two and can have it done in under an hour. Call us today so that we can fix or repair your sliding door and/or track tomorrow.